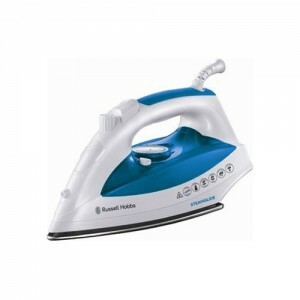 Besides its sleek ultra-modern look, the Russell Hobbs 21570 Steamglide Iron offers a few extras that make it a great iron to pick up for households with light to moderate ironing loads. While far from a professional steam iron for volume loads, this model can hold its own when it comes to regular steam iron duties. What makes this model truly stand out from its competition is the little extra features that add up to quite a bit of a difference. These features are its self-cleaning function, anti-drip system, and a very generous 3 year product warranty. 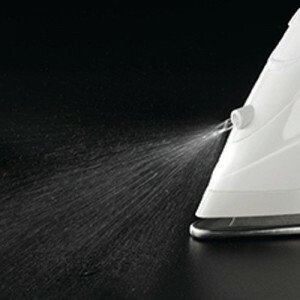 Any discussion of any steam iron must turn on its ability to produce steam and the amount of heat it can generate. These two factors are not negotiable. You might be looking at a product that looks great, is very light, and has all sorts of fascinating bells and whistles. However, if that unit can’t hold its own when it comes to steam power and heat, then that unit is not worth buying. Thanks to the Russell Hobbs 21570’s 2400 watts power supply, this model can produce steam at high heat. Besides its decent continuous steam output of 35 grams per minute, users can enjoy a 110 gram steam shot. This is possible in no small part to this model’s 300 gram tank. While these numbers are not at the very high end of the scale, this model’s steam power and heat levels are good enough to make it an acceptable choice for run of the mill ironing loads. However, if you typically work on very difficult fabrics, very dry materials, or deep creases, you probably should look at a product which offers more firepower as far as steam power and heat are concerned. Mobility and ease of use are interconnected. The more you can move around while you iron, the easier it is to iron. Why? You can hit certain angles that will take out creases more efficiently and quickly. You will need a fairly light iron to do this. Also, you need enough elbow room. Sadly, this model offers a mix of good news and not-so-good news when it comes to mobility and ease of use. First, the good news. This unit is quite light. This is great for overall mobility. When your iron doesn’t weigh down your arm and hand, you can move it more quickly and you can move it at different angles. This can lead to higher steaming and crease-elimination efficiency. While not as super-light as other steam irons on the market, the Russell Hobbs 21570 Steamglide Iron weighs in at 1.3kg weight is light enough to give you some elbow room and a nice range of motion. Sporting a stainless steel soleplate, this model isn’t as friction-free as other non-steel-based soleplate irons. Depending on the fabric you are working on, your ironing arm might not be able to glide as smoothly and effortlessly through the surface. This can be a big problem if you are dealing with medium or heavy loads. The resistance can add up and can tire you out as you iron piece after piece. Another cause for concern is this unit’s cord length. At 2 meters, this unit’s cord might not be long enough for a wide range of users. Cord length directly impacts mobility and range of motion. If you are ironing with a constrained or restricted range of motion, you might have to take more passes to smooth out a surface. This means additional effort and time. Depending on the size of the load you’re working on, a shorter cord might mean you get tired out more often. 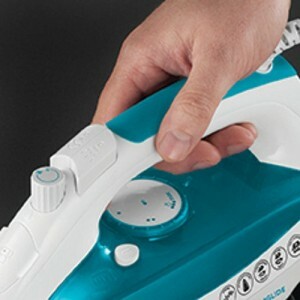 One of the hottest trends in steam irons lately is optimal temperature management technology. There are no heat settings to choose. The iron automatically manages its heat output so it can achieve two things: produce smooth surfaces and avoid burning fabrics. This technology hasn’t come a moment too soon. Too many steam iron users pick the wrong temperature when ironing. While selecting a temperature setting that is too low isn’t normally going to harm you (outside of the fact that you have to make several extra passes to smooth out a surface), picking a very high setting can lead to fabric burns. This uses a variable temperature and steam generation system. You have to manually select the settings. This isn’t too bad if you tend to iron the same stuff over and over again. However, if you are dealing with different types of fabrics or you are working with heavy loads, you would probably be better off with an automatic temperature setting steam iron. You wouldn’t want to be in the position of having to change your variable settings from load to load. Talk about a hassle! If the thought crept through your mind that the Russell Hobbs 21570 is a run of the mill average steam iron, the good news is that its extra features make it stand out from the competition. First, this model comes with a self-cleaning function. Instead of you having to regularly clean the iron, it does this for you on an automatic basis. This can be a serious timesaver. Next, this model has an anti-drip system. This is a big deal. Why? When water drips on to your fabrics, you have to take more time to knock out creases. 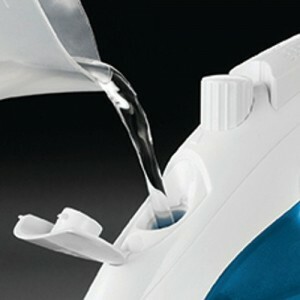 Your iron’s heat has to dry up the wet spots and the steam has to work again on the fabric. It’s like the iron is having to work twice. Having an anti-drip system is a great form of insurance against having to spend more time ironing than you had originally planned. The biggest extra feature that caught my attention is this model’s warranty of up to three years. First, the fact that the manufacturer is willing to back up this unit up to three years means they are quite confident as to its quality. Since warranty services cost manufacturers quite a bit of money, it should give buyers of this model some measure of peace of mind that the manufacturer feels so strongly about this model’s quality that it is backing it up with a three year maximum warranty. If you are looking for an iron that can handle regular heavy loads, you are probably better off looking elsewhere. However, if you normally deal with light to moderate loads and your fabrics aren’t that heavy, this model should make for a good choice.